"L'image de la Triple Alliance est à la fois celle d'une poissance répressive, fondée sur la violence des armes, et elle d'un pouvoir plus subtil, jouant sur la négociation autant que sur une terreur latente soigneusement entretenue. Ainsi, périodiquement, les dirigeants qui ne sont pas encore soumis à la Triple Alliance, ou les proches des vaincus de la veille, sont conviés à assister aux sacrifices humains célébrés à Mexico-Tenochtitlán. Reçus dans le plus grand luxe, ils ont tout loisir d'observer la manière dont les victimes -- c'est-à-dire souvent des parents capturés au combat -- sont offertes aux dieux de Mexico-Tenochtitlán. Il est naturellement hors de question de repousser l'invitation, car tout refus serait immédiatement assimilé à un casus belli." "At the time of the Spanish Conquest, certain Aztec warriors were identified with powerful predators of the natural world, particularly eagles and jaguars, and these have come to be called the eagle knights and the jaguar or tiger knights. (In modern Mesoamerica, there are no tigers, but all wild cats, particularly pumas and jaguars, are called tigre in Spanish.) The Nahuatl metaphor for warriors, in cuauhtli in ocelotl, 'the eagles, the jaguars,' espressed the oppositions of sky and earth and of day and night. The eagle and jaguar knights served Huitzilopochtli, the Sun, and the Aztec cult god par excellence. At the creation of the fifth sun at Teotihuacan, the eagle and jaguar hurled themselves into the burning pyre after Nanahuatzin and Tecuciztecatl to generate the first eagle and jaguar knights. The Aztec myth thus suggests and antiquity to the warrior orders. "Although there was no standing Aztec army, members of the eagle and jaguar knights came from elite society and dedicated their lives to their roles. They frequently participated in public celebrations, particularly of the veintenas. During the month of Tlacaxipehualiztli, for example, the eagle and jaguar knights fought captives tied to the temalacatl in gladiatorial bouts, and engaged in street skirmishes with the Xipe impersonators." "Through the capture of enemy prisoners in warfare, macehualtin trained in their telpochcalli could attain high status, titles, and even access to goods and services otherwise reserved for the nobility. Attainment of progressively higher rank was accompanied by the privilege of wearing particular items of clothing not permitted to other macehualtin. When the warrior had successfully captured four prisoners, he was given the title tequiua. Persons of this title attended the war councils and were qualified to serve in important military and civil offices. The highest military ranks -- tlacochcalcatl ('man of the spear-house') and tlacateccatl ('commander of warriors') -- were apparently then open to the warrior, as well as some civil positions, such as judges." "[W]arfare was the only means of upward social mobility and the acquisition of land. An enlisted soldier who captured four enemies could become a government official or a captain in the army and be elevated to the rank of tequihua, which means 'courageous warrior.' The most highly regarded warriors, however, were the Eagle or Jaguar knights, who were of noble birth and thus exempt from tribute payment." "Una de las cuestiones es hasta qué punto podemos hablar de los guerreros y nobles como una unidad. El hecho de que en el ritual coincidieran casi totalmente las funciones de ambos, a punta en la dirección de que en la vida real existía también una coincidencia muy grande entre ambos grupos. Los guerreros de origen macehual aparecían también en el ritual en conexión con las actividades que les permitían alcanzar grados de la nobleza meritoria. Aunque no todos los guerreros eran de orgien noble, y obviamente, no todos los nobles eran guerreros, el oficio por excelencia del noble era la guerra. La guerra era el ideal cultural para la élite." [T]he armies of Nahua warriors who waged campaigns in what is now northern Mexico, southern Mexico, Yucatan, Guatemala, and Honduras helped create the colonial kingdom of New Spain and were led by Spanish captains. But the vast majority of those who fought were Nahuatl-speakers under their own officers. ... In many ways, these campaigns were a continuation of the Mexica expansionism that had gone almost unchecked for a century before the Spanish invasion." Know now that the King ... has willed that lip-plugs, golden garlands, many-coloured feathers, ear-plugs, armbands, shields, weapons, insignia, mantles and loincloths are not to be bought in the market any longer by brave men. From now on the sovereign will deliver them as payment for memorable deeds. ... He who does not dare go to war, even though he be the king's son, from now on will be deprived of all these things." "Los aztecas y los otros pueblos de la zona se protegían el cuerpo con armaduras llamadas ichcahuipilli. Éstas consistían en varias capas de tejido de algodón o fibra de magüey con un relleno vegetal que le daba un aspecto acolchado. Los bordes se reforzaban con tiras de cuero y unas costuras diagonales mantenían el interior uniformemente repartido. Para hacerlas más duras se debajan secar tras empaparlas en salmuera. [CONTRA Hassig 1988 p88 sv Armor] Este tipo de coraza era sobradamente capaz de proteger a su usuario del impacto de cualquier flecha o dardo. Su forma y tamaño podía variar según la jerarquía social de los combatientes. En muchos casos era una pieza sin mangas que cubría el torso y el abdomen por encima de las rodillas. Por influencia huasteca, desde mediados del siglo XV los guerreros de élite llevaban modelos más complejos llamados tlahuiztli, que no sólo protegían el cuerpo sino también los brazos y piernas. Estas armaduras se cerraban anudando los lazos que para ese fin llevaban en la espalda y eran idóneas para fijar sobre ellas la compleja decoración de la que hacian gala los oficiales y nobles aztecas: estandartes, mosaicos de plumas o pieles de jaguar." "Rewards, honour, and the delights of re-animated reputation came only with the taking of captives from Nahuatl cities -- tough warriors, with much the same system shaping their training and aspirations. If a man took his fifth captive from among these formidable opponents he was acknowledged a quauchic, and distinguished on dress occasions by his vivid red netting cape, blue lip-plug, and most dramatically by his head, naked of hair save for the single warrior lock bound with red cord floating above the shaven pate. Two such distinguished victims, and he could wear at will either the long blue or yellow lip-plug, the breechclout with the eagle-claw or marketplace design, the red or orange leather sandals, the elaborate headdress. When so arrayed 'he filled everyone with awe'. These were the greatest of warriors, 'each of whom was considered [equal to] a battle squadron, who did not hide themselves behind something in war; they who turned [the enemy] back, they who wheeled them around'. From among such legendary warriors the 'general' and the 'commanding general' were selected." "[L]es guerriers qui se distinguent par leur valeur reçoivent également leur part d'honneurs et de parures: colliers de coquillages ou d'os, plumes d'aigles." 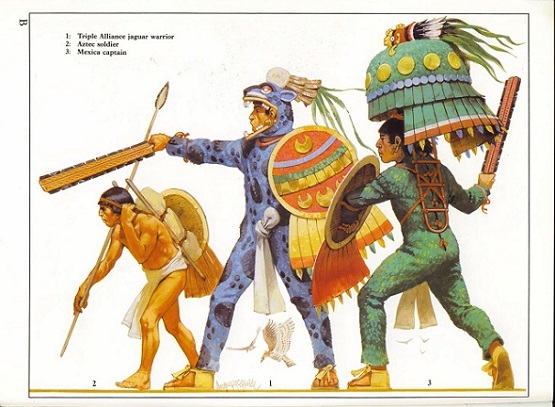 "Soldiers in the Aztec Empire did not wear standardized uniforms. Each warrior outfitted himself in items of clothing and ornaments that not only protected his body but also displayed his officially acknowledged rank and military achievements. A successful warrior earned the right to wear particular styles of helmets, insignia, patterned cloth, lip and ear ornaments, and even hairstyles. A warrior's military rank and record for capturing prisoners was therefore immediately recognizable on the battlefield and at special ceremonies. If a warrior dressed in clothing of a higher rank than he was entitled, he could be put to death. Aztec warriors were not paid in money, but those who distinguished themselves in battle received gifts of clothing and jewelry from the aristocracy. "Knightly Orders When an Aztec warrior had captured more than four prisoners, he could join one of the highest-ranking orders of knights. These were the Eagles, the Jaguars, and the Arrows. Knights wore costumes that were intended to give them the appearance, strength, and abilities of wild animals. An Eagle Knight wore a helmet shaped like an eagle's head with an open beak, through which his face appeared. A Jaguar Knight wore a suit of jaguar or ocelot skins that fitted tightly over his torso, legs, and arms. The fierce head of the animal covered his own head, and his face showed through the sharp teeth." "If, after a certain time, they had taken no prisoners, they were expelled from the confraternity of warriors and obliged to return, in disgrace, to their fields. Then they were merely maceualli, and no longer enjoyed the right to wear jewelry or embroidered or colored tunics. "If, on the other hand, they succeeded in capturing or killing at least four enemy troops, they became tequiua, a promotion which enabled them to draw to a certain extent on the public taxes and to wear certain plumed headgear. At this point they could aspire to become a war chief. "This, of course, was the real ambition of all Aztecs. The first title of the Emperor was Lord of the Warriors. The terms for man and warrior were merged into a single word. Military responsibilities were conferred on the highest dignitaries of the land. 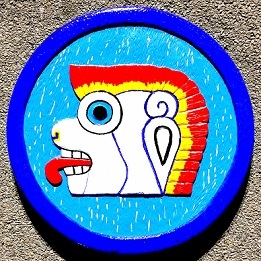 "The bravest warriors were distinguished by renowned military orders: the order of Tezcatlipoca, whose members were known as knights and who fought in jaguar skins, or that of the Soldiers of the Sun, known also as the Knights of the Eagles, and who wore an eagle's head on the front of their headgear. "[...] His armor, ichcahuipilli, consisted of a sort of poncho made of fabrics padded with cotton fibers. His helmet, which was of little utility, was made of wood or paper, often with a tuft of splended feathers. The chiefs used to wear on their shoulders their insignia of rank, made of feathers, gold and precious stones." "[L]os guerreros utilizaban debajo de su atuendo una especie de prenda de protección, llamado ichcahuipilli —lo que ahora podría considerarse un chaleco antibalas. Cuando un hombre se vestía para la guerra, lo hacía según su jerarquía y adquiría el poder del traje que utilizaba, ya fuera jaguar, águila o tzitzimitl." "[E]l arma más famosa de la panoplia azteca [es] el maquahuitl. Era una mezcla entre maza y espada que podía usarse tanto con una como con dos manos. Tenía un mango cilíndrico, que fomaba una sola pieza con una hoja de madera guarnecida por un doble filo de lascas de obsidiana afiladas como navajas. Este durísimo material daba al arma una gran capacidad de corte, más que suficiente para romper las corazas de algodón indígenas. Cuando las cuchillas se partían o embotaban se las sustituía por otras nuevas. El maquahuitl aparece en la mayoría de las imágenes de combatientes mexicas que nos han llegado, pero se probable que se deba a que estas figuras suelen representar a guerreros de alto rango. Lo más seguro es que sólo nobles llevaran esta refinada arma, mientras que el soldado azteca de a pie tuviera que conformarse con la más sencilla y barbata macana." "The Aztec swords (macuahuitl), which the Spaniards quickly labeled with the Taino word macana, seem to have been of at least two varieties -- one-handed and two-handed. These were made of wood, usually oak, 76 to 102 millimeters (3-4 inches) wide and a little over a meter (3.5 feet) long. They had obsidian or flint blades fitted and glued into grooves along the edge. Drawings indicate rectangular, ovoid, and pointed designs. ".... Some swords had thongs through which the user could put his hand to secure the weapon in battle. The two-handed variety is described as being about four inches wide and as tall as a man. Macuahuitl wielders are regularly depicted with the sword in one hand and a shield in the other, but using a two-handed sword obviously precludes that. "The macuahuitl is bladed on both sides and can be used in a powerful downward slash, but it can also inflict a sharp backhand cut. One of the persistent observations of the conquistadors was the ability of these swords to cut the head from a horse with a single blow. Furthermore, the Aztec swords were described by the conquistadors as cutting better than the Spanish swords and being so cleverly constructed that the blades could be neither pulled out nor broken." "By far the single most important weapon used by Aztec soldiers was the macuahuitl, a kind of saw-sword carved of wood and affixed with an edge of obsidian razor blades and bitumen adhesive. Most examples were about three and a half feet (1.06m) long but others were of such size that they had to be wielded with both hands. It appears infrequently if at all in Mesoamerica during earlier times when war was more of an elite activity, so we presume that its widespread use among the Aztecs emerged in response to the need to arm and train large armies of commoners as quickly and efficiently as possible. During the Conquest, one Spaniard described seeing 'an Indian fighting against a mounted man, and the Indian gave the horse of his antagonist, such a blow in the breast that he opened it to the entrails, and it fell dead on the spot. And the same day I saw another Indian give another horse a blow to the neck that stretched it out dead at his feet.' From such accounts we learn that the macuahuitl had little other purpose than to severely maim if not actually dismember the enemy." "The maquahuitl was a two-handed, paddle-shaped sword-club of wood, about a metre (3ft) long, 10cm (4in.) wide and 5cm (2in.) thick, with obsidian blades set in grooves all along its edges. ... The maquahuitl was a deadly weapon and both it and the macana could smash down even those Spaniards equipped with plate armour by the sheer force of their blows. The maquahuitl could also sheer [sic] through cotton armour, for the obsidian flakes were frequently renewed and were razor-sharp. In fact, the very sharpness of obsidian -- sharper than steel, though not holding its edge for long -- was the main reason why the Aztec had not bothered to put to practical use the iron they stored in their treasure houses." "The preferred weapon was the maquahuitl, a heavy wooden club edged down two sides with razor-shapr obsidian blades. Its usage had been characteristic of traditional warfare among élite champions who settled disputes without the involvement of their people. Its effectiveness naturally depended on the personal skills of its owner in hand-to-hand combat." "The most important offensive weapon of the Aztecs was the macana, a sort of paddle-shaped wooden club edged with sharp bits of obsidian. It was so awesomely effective that on more than one occasion during the Conquest warriors beheaded Spanish horses in a single stroke." "The defensive weapons were shields made of wood or woven fibers -- often elaborately painted and adorned with feathers -- and quilted cotton armor. Some of the warriors also wore various types of masks and headdresses to show that they were Eagle or Jaguar Knights or belonged to the higher military ranks."